Barry of ten Argent and Azure, a Lion rampant queue forchée Gules crowned, armed and langued Or. There are greater, middle and lesser versions of the coat of arms of Luxembourg. The greater coat of arms has two reguardant and crowned lions as supporters, the Dynastic Order (the Order of the Oak Crown) and all surrounded by ermine mantling crowned with a heraldic royal crown (the crown used by the Grand Duke). The middle coat of arms has the supporters, the order and the crown. The lesser coat of arms has the crown and the escutcheon without external ornaments. Quarterly: 1 and 4 Luxembourg, 2 and 3 Nassau (Blazon: Azure billetty Or, a lion or armed and langued Gules). The lesser variant of the arms of the monarch has no external ornaments. The middle variant has the supporters, the order and the crown. The greater variant has a dynastic inescutcheon with the arms of the House of Bourbon-Parma (Blazon: Azure bordure Gules charged with eight escallops Argent, three fleurs-de-lys Or). The supporters are holding a lance Or, flying the flag of Luxembourg, all surrounded by ermine mantling with the crown. These arms were adopted in 1898 by Grand Duke Adolphe and used by him and his successors up until Grand Duke Jean. Upon acceding to the throne in 1964, Grand Duke Jean used the lesser and medium arms as adopted in 1898. The greater arms featuring the former territorial claims attached to the duchy of Nassau that was annexed by Prussia in 1866 were, however, unreflective of political reality of the time and were not used extensively: They were only used on the Great Seal of Grand Duke Jean. In 1939, a coat of arms for Prince Jean was created during the centenary celebrations of the independence of Luxembourg and to mark his reaching the age of majority. In 1953, another arms were created on the occasion of Jean's marriage to Princess Joséphine-Charlotte of Belgium. The current greater and lesser coats of arms for the Hereditary Grand Duke are currently prescribed by grand-ducal decree of 31 October 2012 and are similar to that of the Grand Duke's with the addition of a gold label on the shield for differencing. In the greater arms, the supporters also do not carry flags. Henry V was the first Count of Luxembourg to adopt a primitive form of these arms. His father, Waleran III, Duke of Limburg, bore the arms, argent a lion rampant queue fourché gules armed, langued and crowned or (white field bearing a red double tailed lion with yellow claws, teeth, tongue and crown). Henry V replaced the white field by a series of white and blue stripes (burely of 10 argent and azure) to differentiate from his half-brother Henry IV, Duke of Limburg. It is yet uncertain where the origins of this burely of 10 argent and azure are. Jean-Claude Loutsch, Luxembourg's most prominent heraldist, authored the theory that the original Luxembourg dynasties may have born a striped banner (colours unknown). Two dynasties closely related to the first Houses of Luxembourg also adopted striped coats of arms during this period. Both the Counts of Loon and Counts of Grandpré bore the arms burely of 10 or and gules (yellow and red alternating stripes). In such a case, the choice of colour of the stripes would have been determined to match the white field and red lion of Limburg. In 1282, after the death of Waleran IV of Limburg, Henry VI, count of Luxembourg changed his arms by doubling the lion's tail and passing it in saltire as a claim on the duchy of Limburg. After Henry VI's death in 1288 at the Battle of Worringen, Henry VII readopted his grandfather Henry V's arms, which remained in use until the extinction of the House of Luxembourg. The Luxembourg Coat of Arms bears a striking similarity to both the arms of Lusignan and of Stratford. The relationship is unknown, if indeed any exists at all. Historians have generated various theories as to the connection between the houses and the arms, none conclusive. The Battle of Worringen was fought on 5 June 1288 near the town of Worringen, which is now the northernmost borough of Cologne. It was the decisive battle of the War of the Limburg Succession, fought for the possession of the Duchy of Limburg between Archbishop Siegfried II of Cologne and Duke John I of Brabant, and one of the largest battles in Europe in the Middle Ages. 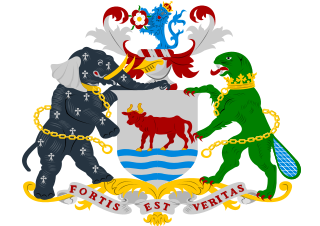 The coat of arms of Sunderland is the official heraldic arms of the City of Sunderland. 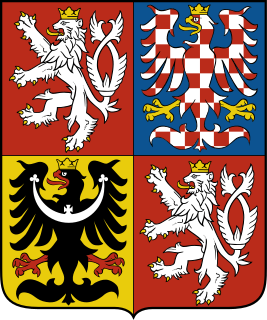 The coat of arms of the Czech Republic displays the three historical regions—the Czech lands—which make up the nation. The current coat of arms, which was adopted in 1992, was designed by Czech heraldist Jiří Louda. The coat of arms of Bavaria has greater and lesser versions. The Coat of arms of Catalonia is based on four red pallets on gold background which have been used since the Middle Ages on several coats of arms. Its origin is strongly related to that of the arms of the Crown of Aragon. 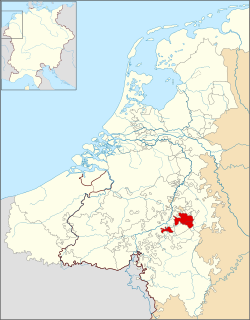 The War of the Limburg Succession, was a series of conflicts between 1283 and 1289 for the succession in the Duchy of Limburg.